I’m back from vacation! 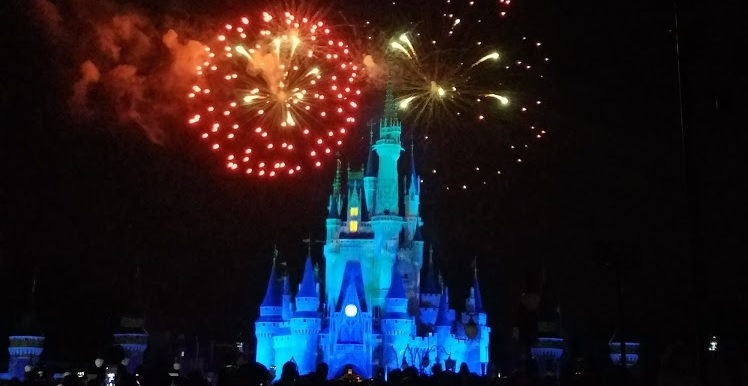 We spent the week at Disney World and the kids loved it. It was truly a magical trip for all of us. 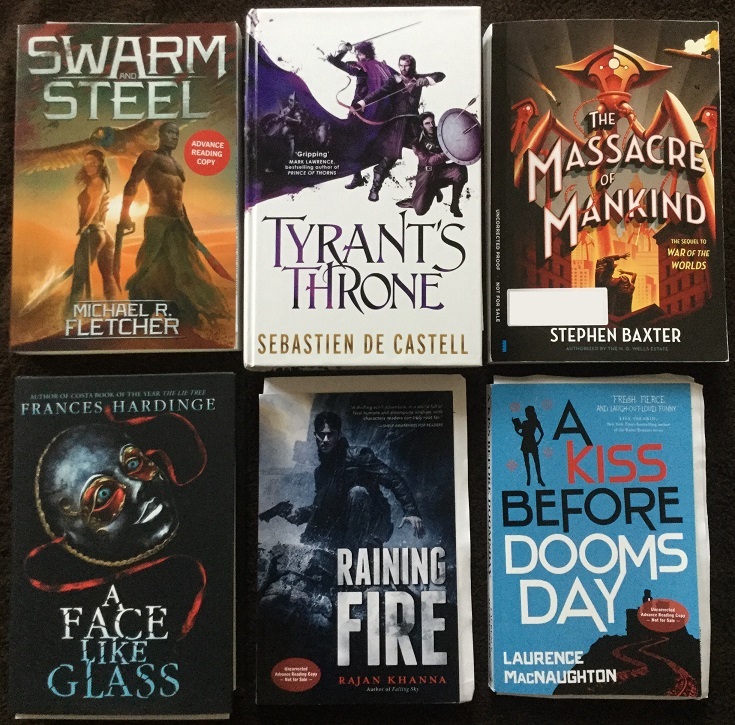 We kick things off with a couple of my most anticipated books this year, including Swarm and Steel by Michael R. Fletcher. Mere words cannot describe how excited I am for this one! Thank you to Talos/Skyhorse Publishing for sending me an ARC. Next up is Tyrant’s Throne by Sebastien de Castell courtesy of the amazing Jo Fletcher Books! I have to say I wasn’t expecting to see a package from the UK among my mail, but my heart was practically in my throat as I opened it wondering to myself…could it be? And it was! 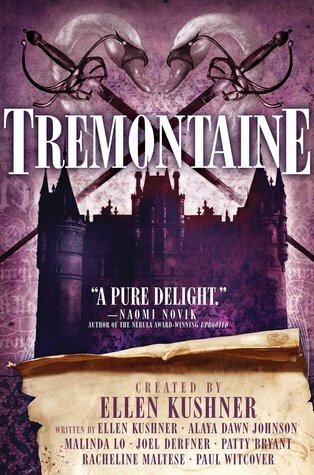 I seriously cannot wait to dive into this fourth book of the Greatcoats series. Described as “the sequel to the War of the Worlds“, The Massacre of Mankind by Stephen Baxter was another surprise arrival, but I’d actually heard about this one when it came out earlier this year in the UK. This summer it will be released in the US by Crown Publishing, and it simply sounds too cool to pass up. With thanks to the publisher for the ARC. I’ve been noticing A Face Like Glass by Frances Hardinge around the blogosphere a lot lately, so it was a pleasant surprise when I arrived home to find that a copy had been sent to me too. 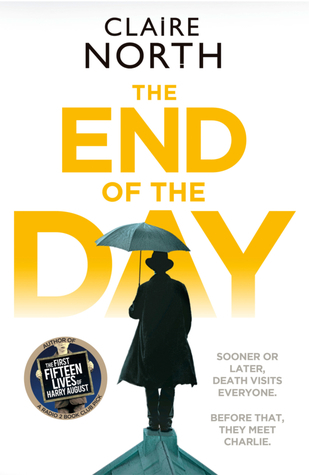 Apparently this is the book’s first time being pubbed in the US, even though it’s been receiving great acclaim overseas for years. I might just take a look at this one later this spring! My thanks to Amulet Books. Also my deepest gratitude to Pyr Books for these two ARCs! I’m still one book behind on the Ben Gold series, but you can bet as soon as I’m caught up I’ll be checking out Raining Fire by Rajan Khanna. I am however all caught up with the Dru Jasper series which is a TON of fun. Later this summer, I will definitely be making some time to read A Kiss Before Doomsday by Laurence MacNaughton! And a treasure trove of goodies from the wonderful folks at Tor Books! 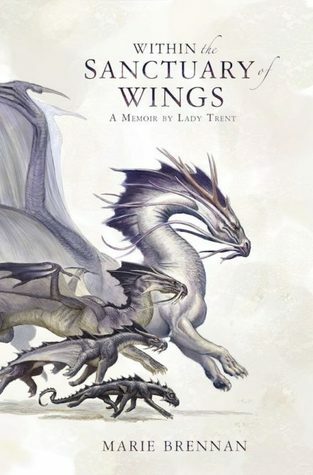 I was thrilled to receive this finished copy of Within the Sanctuary of Wings by Marie Brennan which, like the other books of the series, contains the beautiful dragon artwork by the very talented Todd Lockwood. 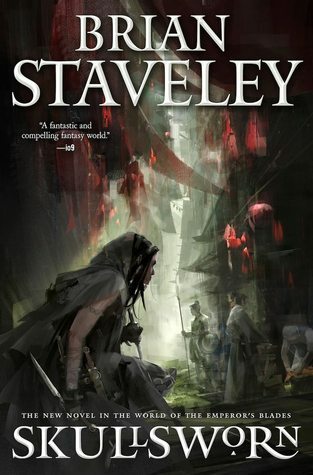 I was also happy to receive a finished copy of Skullsworn by Brian Staveley which was an incredible read! In case you missed my review, you’ll find the link in the Review Roundup section below. Next up is Roar by Cora Carmack – it’s true that I have not been having the best luck when it comes to YA lately, but I am feeling very optimistic about this one, especially given all the positive early reviews. As a bonus, the publicist also included a poster of that jaw-dropping cover, along with a map of the world. And you know how some books just call to you? Pawn by Timothy Zahn was like that, but when I first saw it on NetGalley I had no choice to pass on it because at the time my stats were getting out of hand! An unsolicited finished copy came to me anyhow, but now that I have it on hand I’m going to try extra hard to see if I can fit it into my reading schedule for next month. Finally, Gears of Faith by Gabrielle Harbowy is the newest addition to the Pathfinder Tales sequence. These books are just plain fun, and I just love to indulge in them whenever I can. Thanks again to Tor! And last but not least, my thanks to Crown for sending me this paperback edition of Dark Matter by Blake Crouch. It releases May 2nd, so that’s a great opportunity to check it out if you didn’t get the chance when the book was first released. It was a five star read for me last year! Figures as soon as I go out of town, tons of amazing stuff show up on NetGalley! My thank to Bloomsbury Children’s Books for approving me for Song of the Current by Sarah Tolcser. I learned about this one after seeing it featured on several bloggers’ highly anticipated lists and it does look very interesting. I also grabbed Age of Swords by Michael J. Sullivan with thanks to Del Rey. Sullivan’s one of my must-read authors and I’ve been looking forward to this sequel to Age of Myth for a long time. And of course, when Orbit’s sister imprint Redhook put up Blood Oath by Melissa Lenhardt I jumped on it right away! 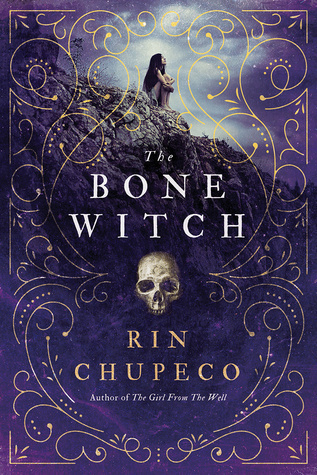 The first book Sawbones was one of my favorite books of last year, and also one of the biggest surprises. While it is neither sci-fi or fantasy but historical fiction, you know how much I just looooooove westerns. I also couldn’t resist requesting Godblind by Anna Stephens when I saw it pop up on Edelweiss. “Grimdark” was the magic word, and it’s a debut too! With thanks to Talos. 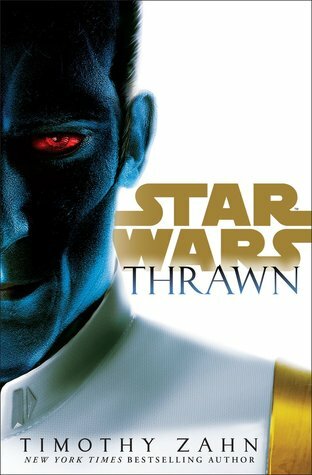 It’s also audiobooks galore as I got to nab review copies of Thrawn by Timothy Zahn and Change Agent by Daniel Suarez – my thanks to Penguin Random House Audio for these exciting new titles! 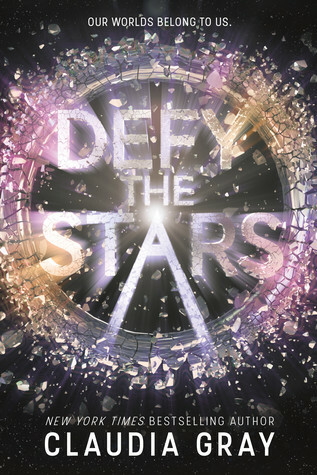 From the awesome team at Hachette Audio I also received Defy the Stars by Claudia Gray, a YA sci-fi adventure which I’ve almost completed as of this writing and so far I’m finding it very enjoyable. Also huge thanks to Macmillan Audio who sent me A Crown of Wishes by Roshani Chokshi which I’m really looking forward to, having adored the author’s debut The Star-Touched Queen last year. Finally, my thanks to Audible for providing me with an audio review copy of Cold Welcome by Elizabeth Moon! I’ve never read anything by Moon before, and I’m quite eager to give this one a try. 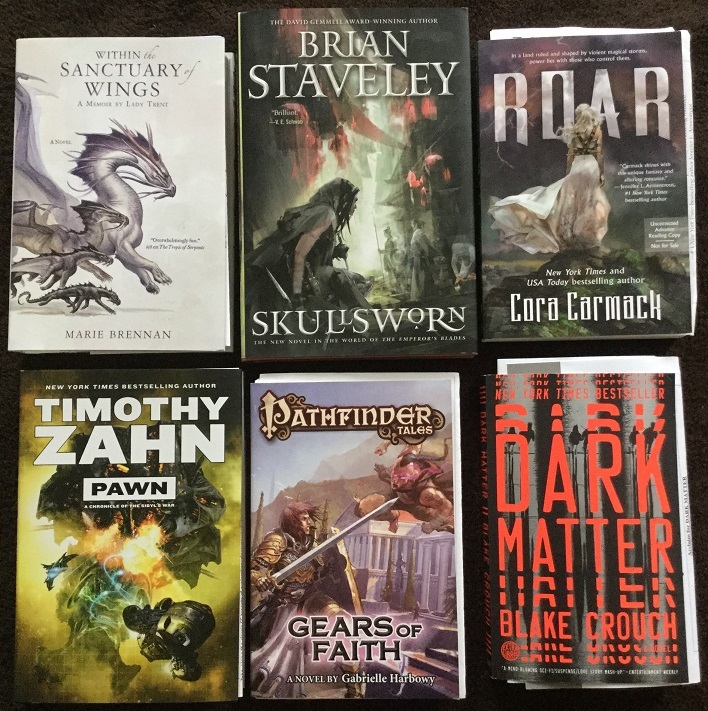 Time for a review roundup! Lots of ups and downs this week, but Skullsworn was clearly the standout and it gets the highlighted spot! While hardly any actual “reading” was done during the last two weeks, I did get a lot of audiobooks finished on the train ride to/car ride back from Florida (~17 hours each way). You should be seeing reviews of these very soon. Oh cool a week at Disney! Glad you had a great time! The Massacre of Mankind looks awesome, I’m really curious about that War of the Worlds revisit. Love the sound of it. The new Marie Brennan looks good too. Song of the Current and Change Agent have me curious too. Great line up! Looking forward to your Sanctuary Wings review especially. Quite a full plate to welcome you back from your vacation! And after such a grueling 😀 experience, there is nothing better than to relax with a good book (or two, or three…). I’ve been hearing very positive things about Dark Matter by Blake Crouch, can’t wait to hear what you think of it! ooooohh, the new Marie Brennan book looks so good!!! Last time I was at the bookstore they had a beautiful display of her books. I was reading them as they came out, but I kept losing track of what was going on between the books, so i think i’m going to wait till there’s 2 or 3 that I haven’t read, and then binge read right through. You abandoned us, your fake friends, to spend time with your family? What kind of monster are you?!? Yay Disney!! I’m tentatively planning a trip back there for myself for next October! I’ve always wanted to visit during the Halloween season, so I am thinking of making that happen in 2018! Nice new reads too! Quite a few new to me ones but I’ve been seeing a lot of love for Roar! I’m really curious about Defy the Stars myself! Hop you enjoy all the new reads (you’ve yet to read!)! Great book haul and lots of reading too. The book that really stood out for me was the Melissa Lenhardt. I still haven’t read Sawbones but I intend to get to it soon. This is a series that I think I will really enjoy and I notice that the third book is also planned fairly soon after Blood Oath so no long wait – at least I think it is!. I have to admit, I’ve been burned out a bit on ebooks lately. I don’t get nearly enough physical ARCs or finished copies, but the 2 I landed from Titan this week both catapulted to the top of Mt. TBR. I just saw the two Titan titles you received, I agree they are definitely worth getting excited about! Glad you had a wonderful vacation. We tend to to stay-cations more often because of the pups and I too think vacations sometimes wear you out more. It had to be a blast though. So many good books this week. I can’t wait to read Roar and A Kiss Before Doomsday. I think Blood Oath looks like something I need to research as well. Hope you have a nice restful week while you get back into the swing of things! I love stay-cations too, or taking trips to places that are closer to home. Every once in a while it’s always fun to splurge on a getaway though, and now that the kids are older we’re also feeling more courageous and confident going to farther places 😀 I also can’t wait to read Roar and A Kiss Before Doomsday, both are on my most anticipated list for this summer! I so want the Cora one! happy reading! Great Haul!! 😀 I’m kinda curious about Change Agent. I’m very excited about Change Agent, it’s been quite a few years since I last read one of his books! Song of the Current sounds familiar. I wonder if I have it on my radar on Goodreads… Either way, I’ll be interested on hearing your thoughts on it, as well as Roar and A Crown of Wishes. I have the latter book at home, too, and am hoping to get to it in the next couple weeks. My newest books… I think they’re ACOW and Laini Taylor’s Strange the Dreamer, which was quite good. And one of the freebies I received from the Iceland Writers Retreat “swag bag” was a book by an Icelandic author that’s been translated to English: House of Evidence by Viktor Arnar Ingolfsson. Eeeh, such a haul. I’m hoping to get the new Marie Brennan tomorrow as soon as they have it in stock.